Frank J. Rosania attended St. Patrick’s school in Newark, N.J., where he served as an altar boy. He was graduated from Seton Hall Prep in 1941. His home of record is Newark, although his family is from Belleville. 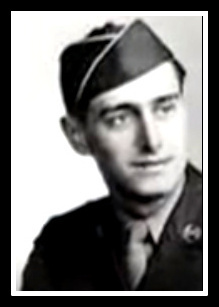 Born March 10, 1925, Pvt. 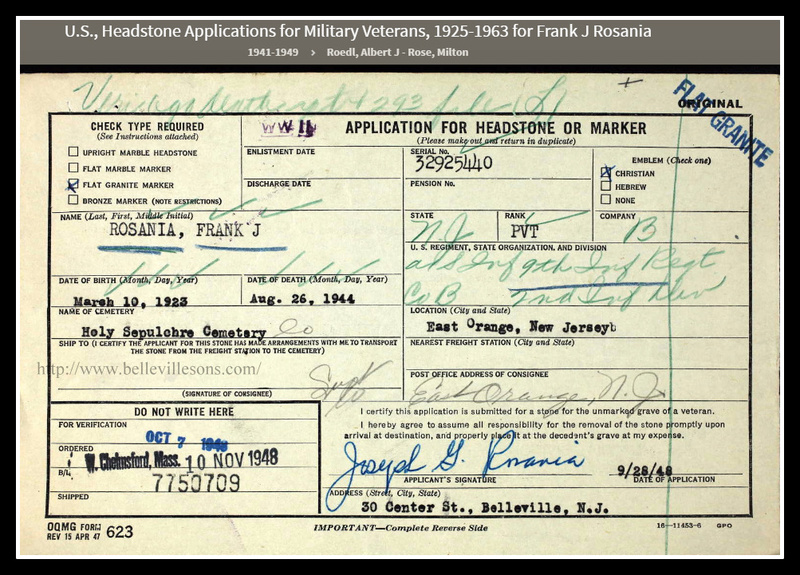 Frank J. Rosania is interred at Holy Sepulchre, East Orange, N.J.
Rosania served as a Tech 3G with the Intelligence Section of Headquarters, 1st Division. 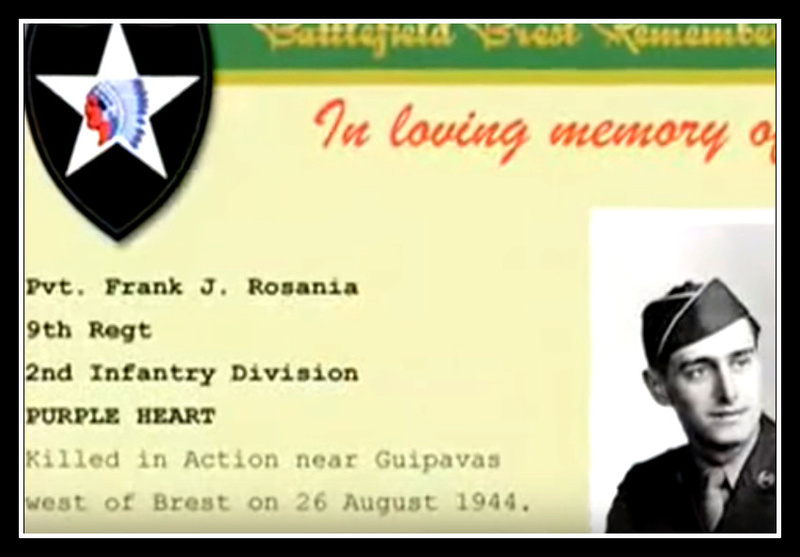 Private Rosania was killed in action on August 26, 1944, during the liberation of Brest, a port city in Brittany, in northwestern France. The Battle for Brest was one of the fiercest battles fought on the Western Front during World War II. Part of the Allied plan for the invasion of mainland Europe called for the capture of port facilities, in order to ensure the timely delivery of the enormous amount of war materiel required to supply the invading Allied forces. It was estimated that the 37 Allied divisions to be on the continent by September 1944 would need 26,000 tons of supplies each day. The main port the Allied forces hoped to seize and put into their service was Brest. Brest was liberated on Sept. 18, 1944, after bitter fighting by U.S. troops of the 2nd Infantry Division and entrenched German paratroopers. The U.S. lost 529 'Indian Head' infantrymen whose sacrifice is remembered each year at ceremonies held in Fort Montbarey. -- Fallen Soldiers in Brest, Ronan Urvoaz.